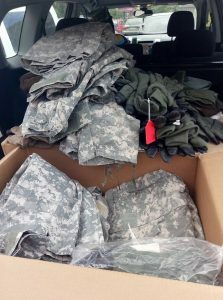 Volunteers in Kyiv received 3 boxes of uniforms, as well as military boots, gloves, summer hats, belts, thermal underwear, raglans, and socks. Soon to be distributed to soldiers in volunteer battalions. This entry was posted in Humanitarian Aid and tagged boots, soldiers, thermal undergarment. Bookmark the permalink.